It’s been awhile since I’ve been anywhere and felt so completely like the new girl. Last week, I was in Eastern Europe- Georgia to be exact and for the whole time I was there, I didn’t see another Black face. It was most disconcerting being stared at constantly. But that’s half the fun of being a domestic violence activist- it takes you to some very unusual places! I was training a group of prosecutors and once we’d got through the language barrier (thanks to the wonderful interpreters), we discovered that (a) domestic violence happens all over the place; (b) it looks pretty much the same wherever you go and (c) there are committed people everywhere tackling the scourge that is domestic violence. Because domestic violence is about power and control, it doesn’t matter where it’s happening, because the root cause is the same. There might be some superficial differences in the types of violence that occur, but fundamentally, it’s the same. We had a lively debate about whether domestic violence is caused by alcohol or drugs or stress or anger (also very common beliefs about domestic violence). As we went back and forth, it occurred to me that these factors were just like make-up. No matter how little or how much make up a person uses, there’s still a face underneath. When all is said and done and the make-up is wiped off, you’re still left with two eyes, a nose and a mouth. It’s the same with domestic violence. The violence is fuelled by a desire to exercise power and control over your partner. Sometimes, these other factors are also present, but in the end it comes down to a simple choice about whether or not to use violence to get what you want. The next point I’d like to make is that the challenges that we face in tackling domestic violence are pretty similar wherever you go. However, where there are challenges, there are still committed people who are up for the challenge of ending violence against women. We’ve just had the 1 billion rising event on the 14 February and next Saturday is International Women’s Day. I don’t know many activists who will be saying “Oh no, is it time for another event to highlight violence against women? I’m tired; I think I’ll sit this one out”. In my experience, it doesn’t work like that. If you’re in, you’re in and you seize every opportunity to speak out and take action. No woman is free, until we’re all free! Finally, in spite of all the challenges, I think that there is still hope- as long as we don’t stop trying. When I think back to how things were, when I started this journey 14 years ago, there is much to be thankful for. As a junior prosecutor presenting a domestic violence case, I remember being told by a judge that I was in the wrong court. He said I should be in the family court, because domestic violence is a family issue and not a crime. Attitudes may not be perfect now, but they have definitely shifted from there! In spite of the ongoing violence against women, in spite of the efforts to shut down the conversation and in the face of serious injustices, we continue to fight to end this attack on women. As I end this piece, I’d like to encourage you to think about your attitude to domestic violence. What are your beliefs about it? Are you ready to stand up and speak out about it? Do you want to leave a better world for our daughters, where they don’t have to fear being that 1 in 4 woman who will experience violence in her lifetime? Been affected by anything in this post or just want to speak to someone in confidence about domestic violence? Contact us through the website. I have a confession to make: I took my practical driving test about 6 times before I passed. It was mostly nerves, but on one test, I clipped the kerb, which is an immediate fail. I remember when I was learning how to drive. My instructor kept telling me “don’t hit the kerb”. I thought the best way to avoid hitting the kerb, was to keep looking at it. Turns out that’s the worst thing you can do. The more I looked at it, the more I drove towards it. One big bump later, I had hit the kerb! This week’s piece is about focus. Specifically, the fact that we become what we focus on. How often have you heard people saying “I don’t want to turn out like my mother or I don’t want to turn out like my father?” 20 years down the line, you hear yourself say something and you realise that you have in fact turned into your mother or father! The truth is if you spend all your time focusing on what you don’t want to become, you don’t have the time to work out what you do want to become. And in the absence of anything else, you become exactly what you don’t want. I’d like to suggest a better way. As well as identifying those things you don’t want, identify the things you do want and work on a principle of replacement. For example, you don’t want to be critical or judgemental (sort of a recurring theme for me at the moment). Identify the qualities you would rather have, which might be understanding and empathic. When the situation arises to be critical or judgemental, take the time to deliberately choose to be understanding and empathic instead. It may feel stilted at first, but the more you practice, the better you will get. I’ve tried it and it really does work. 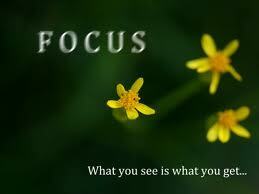 The good thing about focus though is that it can help us to achieve our dreams. Much like driving into the kerb, when we focus on a dream, visualise how it will work out, we have a much better chance of seeing it come to life. When I decided to set up my business, I had a very clear picture in my head of who my clients would be. I knew that I wanted the different components of the business to work together to help women look and feel their best. Having focus also helps me to make decisions about what I should and shouldn’t take on at work. Which in turn helps me to become more productive and far less stressed than I could be! Finally, the person who says “I can” and the one who says “I can’t” are both right. The only difference is their mindset. The human brain is very adept at providing the evidence we need to support whatever position we take. It’s a bit like being a lawyer preparing for a case. You find the evidence that supports your case and find ways to minimise the effect of the evidence that doesn’t. If you start from a positive mindset, you are more likely to see those things that will help you to achieve your goal and minimise or discount anything else. Obviously, you should try and maintain some balance, but on the whole, having a more positive outlook makes you more likely to succeed in life. Are you focusing on the wrong things? Would you like some help to refocus? Coaching can help you to unlock your full potential, so that you become the best you. Contact us through the website and start your journey today. If you’re after some gutsy, raw, soul on love and loss then you don’t need to look any further than the Queen of hip hop soul herself-Mary J Blige. I don’t know about you, but she’s been a kind of recurring theme in the soundtrack to my life. It’s Valentine’s Day today, so I thought I would go with the flow and do a piece on love. Now, contrary to what film-makers would have us believe, love ain’t like it is in the movies. Love can be challenging, people sometimes make terrible mistakes and sometimes it doesn’t seem like love is enough to win the girl or the day! But one thing love isn’t supposed to do is hurt. This week, I’m bringing my spiritual side out to play and basing my observations about love on the Bible. 1 Corinthians 13 contains the most well known verses on love and I can’t think of a better day to remind you or myself of them, than on Valentine’s Day. First up is the deceptively simple verse that says love is... kind. Unfortunately kindness seems to be in short supply these days and never more so, than in an abusive relationship. There is nothing kind about constantly belittling your partner, calling her names or bullying her. 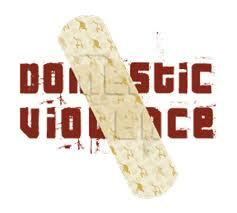 For a victim of domestic violence, it’s like constantly teetering on the edge of a cliff. 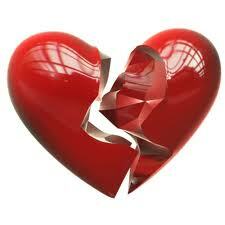 You’re never sure who’s going to come walking through the door: kind, charming partner, or abusive, hurtful one. Keeping you off balance is just one of the ways that an abuser maintains control. My second verse is “love...never boils over with jealousy”. Have you ever noticed that the people, who are most accusing, often turn out to be doing what they are accusing you of? Jealousy is one of those traits that masquerades as caring in the early stages of an abusive relationship. The perpetrator tells you he doesn’t want you wearing certain clothing or seeing certain people, because he really loves you and he doesn’t want your special bond to be broken. Once the perpetrator succeeds in isolating the victim from friends and/or family, then it’s more than likely that any attempt by the victim to re-establish contact with people other than the perpetrator will lead to terrifying fits of jealous rage. Name calling, sexual violence, false accusations and isolation are just some of the things an abuser will do, in order to maintain control over the victim. Lastly, “love... does not act unbecomingly”. Using this phrase seems a bit incongruous when we’re talking about domestic violence. Because in reality, all the things that the perpetrator does to maintain power and control are unbecoming. Using coercion or threats; using emotional abuse or using intimidation are all hallmarks of an abusive relationship. The core of a healthy relationship is equality, not power and control! Follow that principle and everything changes. Love in the context of an abusive relationship isn't really love. It's power and control, all dressed up to look like love. It's like opening a beautifully wrapped present, only to find that there's nothing inside. I’m pretty certain that this wasn't what you were expecting when you started reading this post. You might have been expecting an ode to love? Or 3 top tips on how to find real love? Sorry for the disappointment. My intention in writing this piece was to remind us all that for some women, Valentine’s Day is just another day to be abused. That for some women, the only time they get chocolates and flowers is after a violent attack. I saw pictures of Rihanna, with Chris Brown in court this week and it seems that they are definitely reconciled. I truly hope for her sake that there won't be a repeat of that horrifying violence from 4 years ago and that this reunion is not a triumph of hope over reality. Been affected by anything in this post? Looking for help in an abusive situation? Then contact us through the website, for your free 30 minute consultation. As a small business owner, I’m usually to be found scouring books, magazines or the web, for advice on how to make my business better. On one of these adventures, I came across a blog that asked if I knew who my ideal client was and if I didn’t know, that was not a good thing. I think it was in connection with highlighting the benefits you would ‘sell’ to that ideal client. It makes perfect sense, but sometimes all this advice just makes me want to run, screaming into the night (I hear some of you saying, then why keep looking it up? I know, I know!). Anyway, because I have a slight streak of contrariness, I thought that rather than give you a laundry list of the ‘spectacular benefits’ you’ll get from working with me, I will tell you 3 things you won’t get. I just need you to keep reading and I promise that by the end, you’ll understand completely and be very glad. The first thing you won’t get from me is judgement. This is not because I am super human (those of you who read last week’s blog, know that I’m still working on that front). It’s just that in the context of my professional life, I seem to be better able to approach situations with compassion and understanding. The last thing a survivor of domestic violence needs is judgement from the person she has reached out to for help. The difference I think is that unlike in my personal life, I have no direct stake in the situation that my client is presenting. Also, I think it’s easier to avoid being judgemental when you know the dynamics that underpin a situation. I know that domestic violence is about power and control and that seemingly perplexing behaviour on the part of the survivor is to be expected. Similarly, when it comes to women’s relationship with food, having been through the diet wars myself, I understand why women use food in the way they do and I am able to offer a kinder way of tackling the underlying issues. The next thing you won’t get is biased advice. When the people we care about, come to us for advice, generally we are biased in their favour. We want what we think is best for them. I’m sure I’m not alone in having offered biased advice to a girlfriend in matters of the heart, only to find that she has reconciled with said boyfriend and I am now the villain! It’s not usually a malicious thing, just that we care for them and don’t want them to get hurt. You can see how this might play out in a domestic violence situation. Your sister/friend/aunt/cousin comes to you and tells you that her partner is abusing her. Your protective instincts come out and all you want to do is help her. So, you tell her in no uncertain terms that she mustn’t go back to him, she must leave immediately, she must call the police and press charges immediately, you wouldn’t take it, if it were you and neither should she. This is not bad advice, but it may not be the advice that she is able to take in at that very moment, for any number of reasons. She may be testing the waters to see your reaction, she may want to talk things through to get clarity or she may even just want someone to know about the violence, having already decided to stay in the relationship. The fact is, it’s not your decision to make and the kindest thing you can do here is listen, bite your tongue and ask what she wants to do and what she needs from you. The last thing you won’t get from me is ‘expert’ advice (unless you ask for it). This is quite closely related to the point above and is an easy trap to fall into, if you are in fact an expert. The thing to remember though is that when a survivor of domestic violence is in crisis mode, i.e. very soon after an incident of violence, the last thing she wants to hear is your extensive knowledge of the theories on domestic violence! What she wants and needs most is help with her immediate situation. Does she need a ride to the hospital? Does she need a place to stay? Does she need help with getting her stuff? What about the children? These are all the things that are likely to be uppermost on her mind. On an emotional level, she needs compassion, kindness and a listening ear. As a coach, it’s about making a connection, supporting her and providing the space for her to come to her own decisions about the situation. So, having told you the things you won’t get from me as a coach who works with survivors of domestic violence, let me tell you the things you will get. You will get compassion and understanding, impartial advice and the space to make up your own mind about what to do next. If you have/or are experiencing domestic violence and would like to speak to someone in confidence, contact us through the website. We offer a free, no obligation, 30 minute initial consultation.